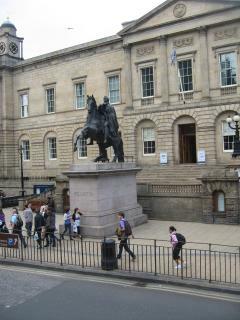 One of the many statues scattered around the city is of the Duke of Wellington. He was known as "The Iron Duke". The statue, erected in 1852 is set in bronze and the sculptor was the famous Sir John Steele. It's easy to see why it is locally known as "Iron in bronze by Steele"! 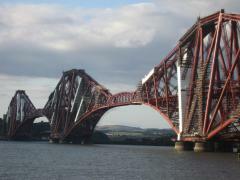 Another far more epic sculpture not far from Edinburgh is the famous Forth Bridge. It's sometimes called the Forth Rail Bridge to distinguish it from the more recently built road bridge, a pretty nondescript suspension effort with a Golden Gate clone feel about it. This baby was born at the height of the Victorian era though, and was the world's first great bridge. There were about 4,600 "briggers" working on it's construction and sadly over 70 were killed before it was finished in 1890. To this day, every train going north from Edinburgh will use it and just to do this is, if you like heights, a great afternoon in itself. Take the slow train and when it returns get off and walk down to the village below it. 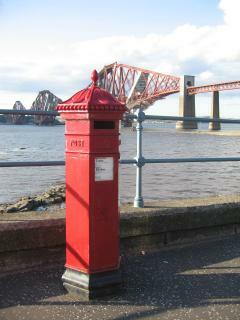 Here's an ancient letter box, older than the bridge itself, standing guard in front of it. In 1871, the then Lord Provost of Edinburgh (the Mayor in other English-speaking countries) bequethed an enormous amount of money for a school to be built in memory of his son, William Fettes, who had died, tragically, the year before. It was meant to be for the poor children and orphans of the city but over time has become one of the top independent schools in Britain. Many famous statemen have attended this school, and it is the model for Harry Potter's possibly more well known but fictitious Hogwarts. It is set in a wonderfully green and spacious campus right in the heart of the city next to the Botanical Gardens. In Ian Fleming's "You Only Live Twice, his famous spy James Bond, or 007, having been thrown out of Eton, is said to have attended Fettes College. But possibly Tony Blair, an ex-Prime Minister if United Kingdom, is the most recent well-known Old Boy. Although the building could quite easily be mistaken for a Loire Chateau straight out of France, if one looks carefully at its details there are distinct features that mark it architecturally as very "Scottish Baronial", like some of the landmark buildings of Canada's capital city of Ottawa. 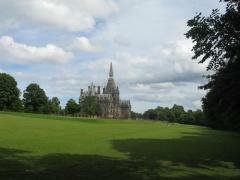 It is a great example of Scotland's unique architecture heritage and easily one of the country's most magnificent buildings. 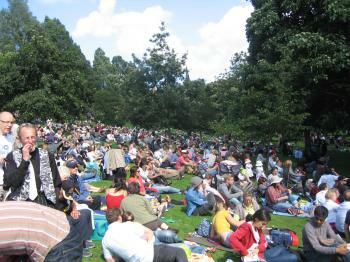 There are surely lots of wonderfully interesting places and plenty of really beautiful sights in and around Edinburgh but in summer, more than anything, the number of people coming here really makes the biggest impression on resident and visitor alike. It is said that from an everyday population of about 430,000 souls, the city easily doubles this count with over 1,100,000 arriving for the Festivals and the Festival Fringe that go on through the months of July and August. Why don't you come and join everyone next year.....I'm sure, like our first guest, be back again and again and again to see Edinburgh in all it's colours. copyright © 2019 楽学＠TheHardwicks all rights reserved.